The second TimeSpace, and room, recounts the pathways of matriarchal cultures. The throne symbolizes the all-encompassing, life-oriented matriarchal power women exercised throughout history. This symbol is derived from the Egyptian hieroglyph for the sovereign Isis, which is equivalent to the word throne. 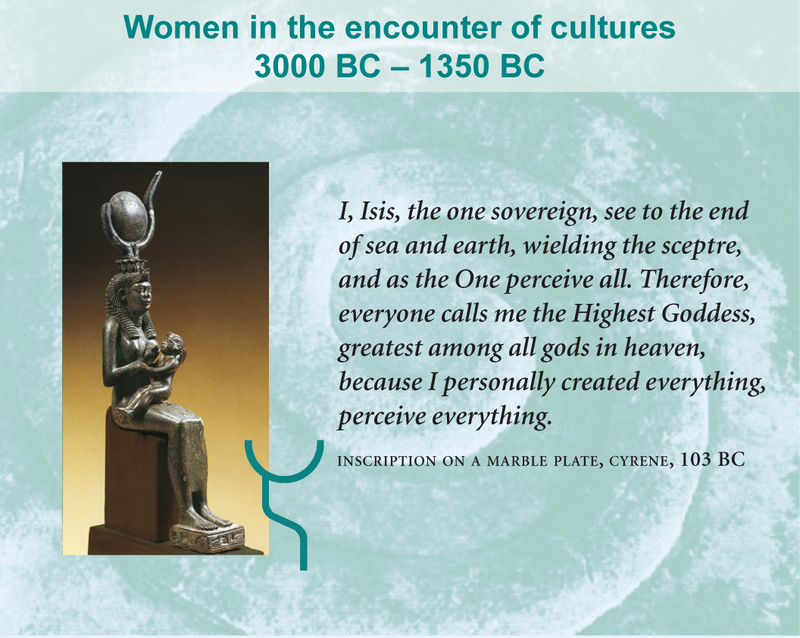 The image of Isis, who nurses her son Horus, vembodies the matriarchal tradition of the transfer of power. It illustrates a particular self-understanding of women of all social classes and cultures and has deeply influenced the depiction of the Christian mother of god Maria. The bronze figurine, 23 cm high, from the Old-Egyption city of Tanis in the northeastern Nile delta was created in the 3rd century BC and today is in the Egyptian National Museum in Cairo.